Does a Fellow’s Involvement in Advanced Laparoscopic Procedures Improve Outcomes? Introduction: With the growing number of fellowship positions, the impact of surgical fellows is increasingly important. One might expect cases assisted by fellows, as compared with residents, to have lower complication rates considering fellows have completed more years of training, have potentially improved technical abilities and are receiving specialized training. On the other hand, cases assisted by fellows may have higher complication rates considering fellows are given more autonomy and may be faced with more complex cases. 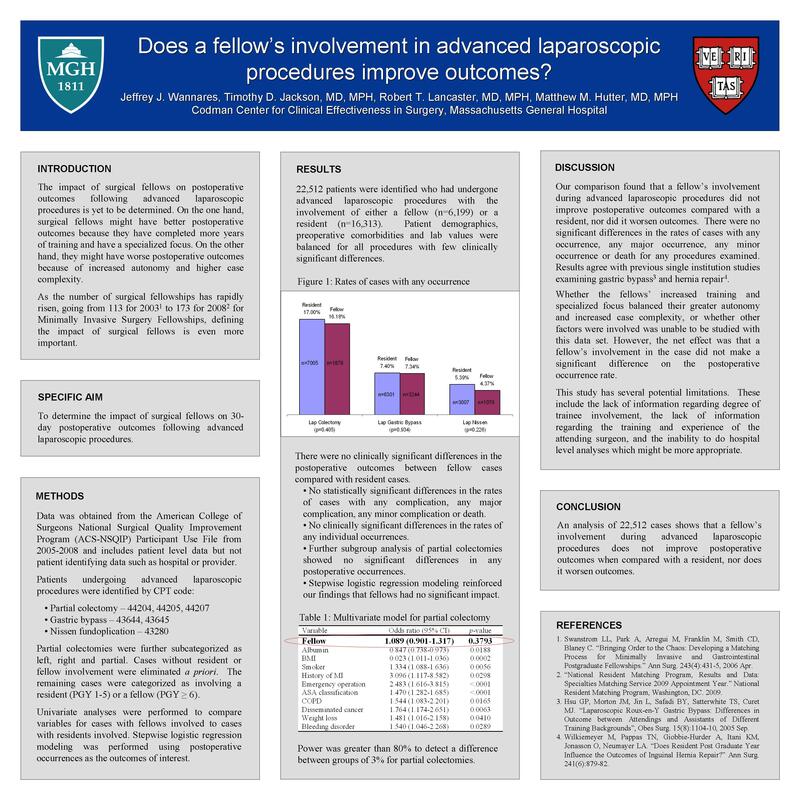 The objective of this study was to examine the 30-day postoperative occurrence rate following advanced laparoscopic procedures assisted by a surgical fellow compared with a surgical resident. Methods: Patient data was obtained from the ACS-NSQIP Participant Use File from 2005-2008. Advanced laparoscopic procedures were determined by CPT code and included colectomy, gastric bypass and Nissen fundoplication. Cases were limited to those assisted by either a resident or a fellow, where a resident was defined as PGY 1-5 and a fellow PGY ≥ 6. Univariate analyses and multivariate regressions were performed by procedure to mitigate issues of case mix. Results: We identified 22,512 patients undergoing advanced laparoscopic procedures assisted by a resident (n=16,313) or a fellow (n=6,199). There were no statistical differences in postoperative occurrence rates following cases assisted by a fellow compared with a resident as listed below. This trend remained consistent during further subgroup and multivariate analyses. Power was greater than 80% to assess a clinically significant difference between groups (less than 3%). Conclusions: In these analyses, the involvement of a surgical fellow compared with a resident did not have a significant effect on 30-day postoperative occurrence rate following advanced laparoscopic procedures. It is not clear whether this finding is due to the advanced training and technical skill of the fellow being balanced by the increased complexity of cases and increased autonomy allowed to the fellow, or whether other factors are involved. Further multivariate analyses will need to be performed to eliminate possible confounders and elicit any significant differences.